I will be discussing Guardian Angels on Relevant Radio at 8 AM Eastern time Friday. You can listen on-line at www.relevantradio.com. I will be doing a show with Teresa Tomeo this morning at 9:30 AM Eastern time. 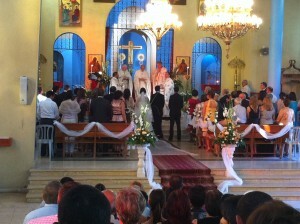 Our topic is “A Modern Day Wedding in Cana.” Actually the wedding was in Nazareth where Mary lived, but it is only 5 miles from Cana. You can listen to our show on-line at www.AveMariaRadio.net. 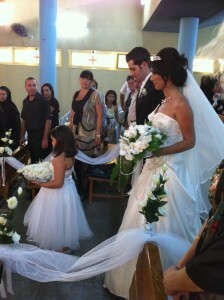 Pictures were taken in September 2010 at the wedding of Amer Shehadeh’s daughter Nagum. Amer is our Catholic guidewhenever we take groups to the Holy Land. We flew to Israel for the wedding. What you see in these pictures is a wonderful Catholic family living the Christian life under difficult circumstances in a mainly Muslim community. They are the living stones of the Church in the land of the Bible. To see more pictures, especially of the pre-wedding parties, click here. To see my run from Nazareth to Cana and back, click here. To check out our upcoming pilgrimages, click here.